Now that I’ve begun to get settled in, it’s been good to be back in the wonderful world of game development properly. And given the updates coming next, it was a good time to jump back in. Perhaps I should just say it now. During the month of March we had two, count ‘em, two major milestones achieved. To say that I’m pleased would be quite an understatement. So what happened? Let’s start with what’s probably the simpler one to explain. The first major milestone I want to go over is for a game that I’ve not said much about. For this larger game that I’ve been working on, I can finally come out and say that all the gameplay for this game is complete on a basic level. All player abilities are operational, even if not fully fleshed out. Some simple enemies have been created which can be expanded upon later, and the upgrade system (you read that right) is in place. There’s a basic gameplay loop in action. What comes after this? At the moment, I’m still figuring that out. This event, as of this writing, only happened a few days ago. Just in time for the dev blog, am I right? While I still can’t show or tell much, I figure we could celebrate this momentous occasion by giving you a very, very alpha screenshot. Have I mentioned that it’s 3D? I’m sure I’ve brought up the basics of the game before but if I’m honest I really don’t know which dev blog entry that could be. But yes, as you can gather from the screenshot (again, extremely alpha), the game is a first person shooter (FPS). Astute eyes can probably tell that this project is using Unreal Engine 4, which felt perfect for the kind of game I wish to make. You have your health, a gun with infinite ammo (between this and War Ender, I’m quite generous with ammo), a compass, and another gun with…fire ammo? Hmm, interesting. We’ll leave this big game alone for the time being. It still needs plenty of time in the oven, after all. Let’s move on to Impressions, a game that I allow myself to say much more about. It also hit a major milestone, though what was achieved is a little less obvious. In a nutshell, the game is far along enough that I was able to come up with a basic demo for it. This demo isn’t available to the public though, sorry. It was created to show a certain artist what the game was all about. However, the fact that it could be created at all speaks well to the game’s progress. To create this demo, a few things needed to be done. First, character customization needed to be allowed. A very important aspect of Impressions is letting the player be themselves in the game. And that all starts with the basics, such as your gender and name. Now Impressions addresses you as he or she, and will call you by your name. Or, if you like, you can have the game refer to you as “Butter.” It’s up to you. Once you’ve got your character created, the game begins. From there, the progress continues. The first in-game day is fleshed out and ready. The characters now correctly respond to your various actions. So if, for example, you start the game talking about the greatness of aliens coming only to then suddenly call them mean names, the game will call you out on your inconsistency. The remaining days still need this aspect worked on, but it’s coming along. In addition, three of the four in-game days are playable from beginning to end. All that remains is day four, which is effectively the part where you get your ending. So, everything leading up to the game’s final moments is playable, and it’s just the ending section that needs working on. The next major steps involve getting the game’s endings in order and allowing the remaining days to have the same responsiveness of the the first day. Doing all this could be potentially tricky since you have to program the game to be mindful of more and more choices as the story progresses. But once those things are done, the only other tasks remaining are polish. That includes technical polish as well as writing polish. And of course, there will be music, sounds, and art that doesn’t look like it was made by a programmer. Numerically there isn’t that many tasks left to do for Impressions! But let’s not underestimate the work that remains. Just because you can count the number of things to do on your fingers doesn’t mean the path will still be easy. Making sure Impressions reacts to the player correctly for the remaining days will most likely be the hardest task and could take some time. All I can say is that the game is ready when it’s ready. How long that may be is something I don’t even know. But with this milestone completed, Impressions is that much closer to being finished. I’ve had an interesting last few weeks. Part of the fun of writing a dev blog for February is that you don’t have as much to say since it’s a shorter month. Granted, it’s only a few days shorter, but less time is less time. So what’s been going on in February in the world of Infinite Level? Well, I have a simple answer for that. I moved. The apartment I had stayed in for the last few years was nice, but it was time for an upgrade. Thus, my wife and I have gotten our own house. Now I can be as loud as I want! In all seriousness, the moving process is long and exhausting. Technically I’m not even done as we haven’t finished unpacking. I would be lying if I said much had happened in the game development scene. But the whole process got me thinking about what a game developer must do while still going through a monumental change. Eventually I settled on something very simple. The moving process gave me time to reflect on the past and think about the future. The events that happened before the big move were obviously a big deal. War Ender came out. That was easily one of the biggest things to happen in my life. And thankfully, the positive reception I had seen from before releasing War Ender carried over into launch day and beyond. Not too long after that, a batch of extra levels was released for War Ender which revived some old levels that didn’t make the final cut. 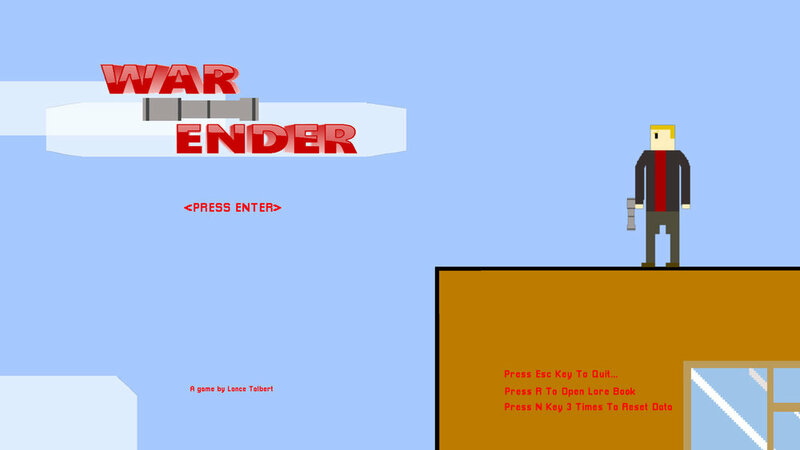 It also showed off a “concept level” that was created when War Ender hadn’t even gotten it’s official title yet. Sadly, due primarily to the need to work on other things, that first batch of extra levels for War Ender was also the last. There’s still some other levels that were scrapped that could have seen the light of day had I allowed myself the time to create them. But there comes a point where, as a game developer, you have to decide when to let a game go and move on. For my first game, that first batch of extra levels was that point. I can still say that War Ender does the things I ultimately wanted it to do. War Ender’s development comes to a close, and in remembrance I keep a few things that I had related to the game. This includes the banner I used at conventions and a little sign I made for the game. Unsurprisingly I place these items in my new office, reminding both myself and those who come in where I came from as a game developer. Well, partially at least. Now with that game complete, some new ones arise and prepare to take center stage. Last month I revealed Impressions, the first of my intentionally small games about a trio of pundits talking about extraterrestrial aliens. Much like how buying a house represents a fundamental change in both how I live and how I view certain things, Impressions represents a shift in how I make video games. Impressions is much more story driven than anything else I’ve ever made. While that makes things like game mechanics and programming easier, it still has its own set of unique issues that I will have to tackle. During February I finished coding in the basic story beats of Day 3. On top of that I also made several passes through the game already and took note of which places need to change more based on player choices. I’m also beginning to think harder about what kinds of polish will be needed as the game goes on and how I wish to handle the game’s release. Being a smaller game there’s less pressure for it to make as much noise as War Ender. Yet at the same time you still want to be sure it gets in people’s game libraries. It’s a far cry from how War Ender was when thinking long term. In fact, just about everything with Impressions differs greatly from War Ender. Just like, you guessed it, house life versus apartment life. The two require different things and different approaches to those things. It will be interesting to see how my development sensibilities change now that I’m in a new environment. And it will perhaps be even more interesting how I fare with a more story driven game compared to a mechanics focused title. It certainly is the season of change right now, and it is quite exciting. Now that I’m beginning to settle in, I look forward to seeing where Impressions goes over the next month. Look forward to more updates in the future! I know I originally said I would hold off on showing anything about the small project. But after thinking about it for a month and getting the opinions of others, I feel I may have misspoken. So, without further ado, allow me to show you what I’ve been working on for the last few months. Just bear in mind that everything you’re seeing here is in the alpha stages of development. Not that this should come as a surprise to you. Just look at that programmer art. This is the alpha version of Impressions. Impressions is a game where you take control of what is essentially a pundit. You and two other pundits have the pleasure to discuss one of the greatest moments in human civilization. It has been confirmed that aliens are real. Not only that, but we were able to communicate with these aliens. And so the world (well, most of it) now acknowledges that we truly are not alone in this universe. But not everyone agrees on how we should approach this life changing discovery. The game is split into four days, with each day relating to alien activity in some way. For example, the first day is all about initial thoughts on knowing we’re not alone in the universe. When a day begins, you’re shown a brief article about what you will be discussing and some early thoughts from some of the off screen characters in the world. Navigate to another screen to check out what the general public is saying about the event on the internet. Suffice to say, initial impressions (ha) are quite divided. After reviewing this information, you move on to your job. You and two others are gathered around a newsroom to discuss these events. As you may have guessed, the discussion gets quite heated. On the left is someone who believes this can only be good news for humanity as a whole. She is already fantasizing about the great things our species can accomplish thanks to this newly formed relationship. To the right lies someone less than thrilled about the news. He believes this could mark the beginning of the end, and that we cannot simply trust these aliens. At least not now. This is where you come in. You’re effectively the mediator. As the discussion continues, you will be asked to give your thoughts on the situation. But of course, you have a lot of eyes on you. What you say will be heard across the world. And perhaps even more intimidating (or exciting, depending on your point of view), the aliens will be witnessing your commentary as well. So what will you say? Do you side with the woman to the left and think this is positive news? Or perhaps you agree with the man to the right and think this is a bad thing all around? Maybe you’re just not sure yet? What you say will affect the story and world around you. Sometimes those consequences are felt immediately, while other times you don’t see the end result of your decision till later. In the above gif, the conversation happening is suggesting that the player has a generally positive take on this news, and the dialogue following that choice reflects that. Though gameplay is relegated to this newsroom, you’ll get a peek at how your choices affected the rest of the world during the “pre-day” segments. On Day 2, the article you read will change based off your choices, and the public reaction will be different depending on your leanings and even some of the individual choices you make. The whole world is watching what you do. No pressure. As noted earlier, this game is still in the alpha stages. But it became important to start sharing what was coming up. Currently the game has two days of story beats programmed with the third day halfway complete. There’s still several checks that need to be done to make sure the choices the player makes will be felt throughout the game, and obviously a proper artist will be needed for the project. I’m hoping to have a much more polished game to show off within a couple months, but that will certainly be dependent on a few things. Hopefully you enjoyed this early look at the game. Now that I’ve officially unveiled it I’d like to do more posting about it in future. So be sure to follow me on Twitter to get the latest info. Keep an eye on War Ender’s Facebook page as well as I’ll be sure to post updates on the game there. As stated before, I’d like to finish this game sometime in Spring, and I think I’m well on my way to accomplishing that. Day 3’s story beats are nearly finished, and Day 4 is looking to be fairly easy. Keep an eye on this dev blog as well as the aforementioned social media to see how the game is shaping up. And above all, as exciting as Impressions will be, don’t forget to show War Ender some love. What does the first level do to get you excited for the adventure ahead? First impressions are very important to any game. They can win over a player or make someone drop the game forever. So how do I go about creating the first few levels? For some, these may be the only levels anyone ever plays if they aren’t impressed. To create a good first play session, a little setup is required. Today, I’m going to show you how I went about creating the game’s first level and how I believe it serves their purpose. Let’s begin with the setup. Every time you boot the game, a short cutscene plays. Of course, you have the option to skip this cutscene if you so choose, but I would encourage players to at least sit through it once. Why? This opening gives a lot of context as to why you, the player, are doing what you are doing. In War Ender’s case, it’s a very simple premise. It’s a revenge story. It’s about an angry guy in a coat who wishes to avenge his dead friends. As soon as he learns who committed the crime, he goes after them. Thus ends the story setup, but we’re not quite finished. There’s also the tutorial, which introduces the players to the game’s mechanics. Thankfully, because of the player character’s limited range of abilities, this is the only tutorial they have to go through. After a few minutes they are introduced to all the player character’s abilities and examples of where to use them. Now with all this in mind, they can jump into the action that awaits within The City. And yet, just before the game begins proper, they get one more little story tidbit. Once again, they can skip this, but I think it helps put a player in the right mindset for the first level. Something is going wrong, and you’re the one who’s going to fix it. Now the game begins. But at first, there aren’t many enemies. In fact, there’s no enemies at all at first. I want to allow the player a little time to adjust to the physics of the world before they start getting into firefights. Once that’s done, enemies appear. But they’re pretty basic, All they do is walk back and forth endlessly until you shoot it or you run into it. Almost immediately after that, another enemy type appears. What does he do? He fires a single bullet every couple of seconds. Just in case you took some early hits (and first timers most likely will take damage), there’s a health box that restores three of your health points, which will most likely get you to the first checkpoint. At that point, I’ve seen players do one of two things. They might walk right into it, like any other checkpoint. Here they see that their health gets fully restored and they now come back here if they die in the next section. However, I’ve seen some players instinctively shoot the checkpoint. Then of course it shatters and they realize what they’ve done. It’s actually kind of funny to watch. But it also teaches an important lesson: you can destroy the checkpoints. Later on they may notice that clearing a level and destroying these checkpoints in the process leads them to additional content such as more lore for the Lore Book and entire bonus levels. The level continues. This is now where concepts presented in the tutorial come back to test the player. In fact, the immediate structure of this section is reminiscent of the early part of the tutorial, is it not? There’s a few enemies to shoot, straight in a line, followed by a wall. They need to run and jump to progress. Next, another section from the tutorial has made its way into level 1. Shoot floating is given a proper case scenario, once involving enemies and another involving a large gap. You must shoot-float in order to make it past the gap. As for the enemies, it is recommended that you shoot-float but it is not required. Not long after this, another checkpoint arrives. Beyond this checkpoint, the geometry begins to get a little more complicated and a whole new enemy type arrives. The stationary turret enters the fray, and it takes five shots to destroy. It fires the same bullet as the basic shooter enemy from before, but at a much faster rate. Learn this enemy and you’ve effectively learned the entire level. At this point, the remainder of Level 1-1 exists to test your knowledge of the game so far. Is there anything I would have done different with the first level? There is one item: I wish I had incorporated something involving the dodge mechanic. Of course the player is shown this ability in the tutorial and can use it anytime, but there’s no scenario where they are forced to use it. At the time, I think I wanted to avoid overloading the player with too many things to think about. I wanted to keep the first level to the bare essential: movement, shooting, jumping, and shoot-floating. Those four things form the bulk of War Ender, and I wanted to make sure players understood this. But I probably could have found a way to remind players of dodging. Beyond that, I think the game’s first level does its job wonderfully. Of course, I might be a little biased. But I do believe it eases players into the world before them, showing bits of the game at a time before it all comes together near the end in a simple test of knowledge. Get past the first level, and you get to the second. In this second level, the level structure changes and there’s more new enemy types to discover. But we’ll have to dissect that level another day. As mentioned in a previous dev blog, I’m going to spend a lot of time going over elements of War Ender I’ve not touched on before, and that includes many of the first levels. I’d also like to take a deep dive into the different bosses and look at how they came to be. But this is all in due time. And besides that, some days I’ll have some important info about my next project. Speaking of future projects, I suppose I can give you a little update on those. They are coming along nicely for the moment. The smaller project is getting close to having 50% of its basic content coded in. I think it will soon be time to start properly getting some art and music together for the game. Being a game based around narrative choices, it will also soon be time to work on how those choices affect your story. There’s one area that I know can affect the story in a major way, but there’s lots of potential for smaller decisions to change the game in small ways. We’re talking as small as a sentence changing based on something you said a few minutes ago. Also, with it being 2019 by the time this goes up, I could maybe give you an idea of when you might start to see more info about these projects. The aforementioned small project is intended to be released this year. Preferably sooner rather than later, but at the same time you never want to rush something. Ideally, the game would release in Spring. Though I don’t know if you should actually count on that. The bigger game is still a long ways away, but I’m thinking about putting some early prototype images together for your viewing pleasure. I’d do the same with the small project, but it didn’t exactly stay in the prototype stage for long and there’s not much to show. And I’d personally rather not show it off too early, given the scope of the game. Look forward to a great 2019! I know I will. Free new content for War Ender has been released! A week and a half ago (as of this writing), War Ender got an update. This update, coinciding with the Autumn Sale, is the biggest update for War Ender. Readers of recent dev blogs will most likely know that I’m referring to the three extra levels given out for free. It took a whole computer getting those levels released and I hope players enjoy them. There’s one level, Extra Level 3, that I particularly want to discuss today, but first let’s do a quick recap of what the first two extra levels were all about. Extra Level 1 places players in what was originally meant to be the first bonus level of the game. In fact, both Extra Level 1 and 2 are scrapped levels from the original game. The reason for Extra Level 1’s removal was pretty simple. Bonus levels needed something a little more special, and what I came up with didn’t incorporate any of the mechanics of the original level, which was just a harder War Ender level to begin with. Extra Level 2 has a similar backstory but with an extra chapter. I debated with myself on whether Extra Level 2 would be a regular level or a bonus level. In the end, it was neither. Thankfully, both of these levels were given new life in the form of Extra Levels. It’s always nice to see old ideas come back to your projects. With the recap out of the way, let’s bring our attention to Extra Level 3. While I certainly didn’t hide its existence, I refrained from talking too much about it, let alone show it. Extra Level 3 was what I will refer to as a “pitch level” which in my head means that it was a level used to demonstrate various concepts for War Ender, or Action Square as it was originally called. In this case, the level showed off basic platforming, how the main character would behave, and what sort of obstacles would be present on the player’s adventure. At this point in time, only a handful of enemy types were created. Not only that, but the shoot-float mechanic was completely different. Enemies in the level included Basic Enemies (the robots), Shooters, Grenade Enemies, Turrets, and Rocket Turrets. As you can see, many of the basic enemy types you’ll see throughout War Ender got their start in this pitch level, with the remaining enemy types coming much later. As for the shoot-float mechanic, it also got its start in this level. Originally it wasn’t so much a shoot-float as it was a shoot-”slow down my descent". That doesn’t have nearly as good of a ring to it, and it was wildly inconsistent. Sometimes your descent would be slowed by a lot, and other times it wouldn’t change anything. So the decision was made to change the mechanic to what you see today. All these differences between then and now don’t stop there. The dodge mechanic wasn’t even a thought in my mind. Various enemies didn’t exist, and many of the platforming mechanics were not present. If you play through Extra Level 3, you’ll notice there are only buildings and “jump through platforms” present throughout the level. There are no moving platforms, jumppads, or torches. Yet another area where Extra Level 3 shows its age. Another detail I left in was the building colors. While some additional decor was added to the level, I intentionally kept all the buildings a brown color. One thing I haven’t mentioned yet is that all three levels have the option to use or destroy all the checkpoints, just like any other level in the game. However, destroying the checkpoints in the extra levels do not contribute to the Lore Book and do not help you unlock any of the bonus levels. The option to clear any of the levels without checkpoints is purely there for bragging rights. That was another thing about these levels that was fairly important to me. I wanted to make sure that anyone can jump in and enjoy them however they choose. Thus, I made sure that the levels could be chosen from the main menu right from the start, regardless of your in-game progress. As for what the future holds now? Well, at this point I’m starting to shift gears. I’ve talked before about two projects I am currently working on, and as usual I am unable to show them off right now. But with these extra levels released, I am planning on moving most of my attention to those two projects. I don’t know when I’ll be able to show them off proper, but I’m hoping it will be sooner rather than later. In the meantime I’ll find some interesting things from War Ender’s to talk about that I may not have touched on much before. Being the December dev blog, I don’t believe you’ll hear from me in this space before the new year comes. I mean, there’s always the chance another freak accident could happen like what occurred in October with my dead computer, but I’d prefer nothing like that occur. So knowing this, I bid you a lovely holiday, whatever that may be for you. See you next year! Keep on gaming.